10-Minute Audio Devotions CD Set can help you deal with the crazy twists and turns on the road of life, especially when you’re on the road. 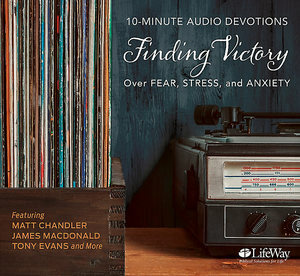 Brief but powerful, these audio devotions will help you navigate through fear, stress, and anxiety. Each CD features some of today’s best Christian communicators, such as Tony Evans, James MacDonald, David Jeremiah, Matt Chandler, and more. The devotions are perfect for commutes but can also be used anytime you have a free ear and a few minutes of downtime: exercising, folding laundry, tinkering in the garage… The devotions cover topics such as renewing your mind, overcoming various fears, the role of suffering, and battling temptation. The two-disc set contains 12 devotions, each about 10 minutes in length. These foundational and biblical messages are sure to contribute to your spiritual growth and understanding. And they make a great gift for friends and family.